This book examines the American system of dating, mate choice, and marriage. It analyzes a wide range of established ideas about how dating and mate choice are changing, and identifies changes and continuities in premarital experiences in twentieth century America. A variety of ideas about what sorts of dating and premarital experiences will make for a successful marriage are tested and for the most part disproven, raising serious doubts about our fundamental assumption that dating experience helps individuals make a "wise" choice for a future mate. Marital success turns out to depend not so much on premarital experiences or on the social background characteristics of couples (such as race, religion, and social class) as on the way in which couples structure their day-to-day marital life together. Through its detailed examination of a wide range of ideas and predictions about dating, mating, and marriage, and through its dramatic findings, Dating, Mating, and Marriage challenges many previous assumptions and conclusions about the fate of American marriage and elevates our knowledge of the American system of mate choice to a higher level. "Outstanding Title!... A comparative analysis of the dating and marital experiences of three cohorts of American women who married between 1925 and 1984. Based on in-depth, retrospective interviews conducted with a sample of 459 Detroit-area women, the findings of this study challenge a number of common beliefs about the impact of premarital behavior on marriage... An exemplary model of an empirical report about changing courtship patterns and marriage, this work is highly recommended for libraries serving upper-level undergraduates, graduate students, and professionals in social sciences and human services." 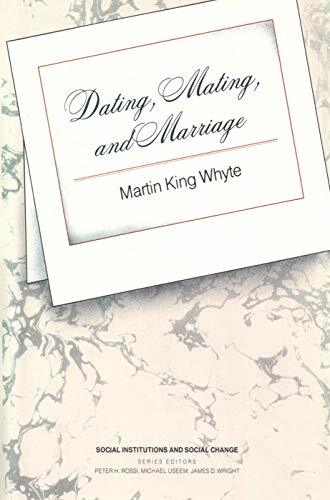 "The state of marriage and dating is described in detail in this book by Martin King Whyte... [T]his is a thoughtful and interesting analysis." "This book addresses contemporary fears about the troubled state of marriage in America but approaches the problem from a novel perspective. The book is less concerned with marital breakdown than it is with the process by which people enter the state of matrimony... The book successfully manages to meet different levels of interest and methodological sophistication." "Martin King Whyte nicely frames a number of questions about 20th-century family and family change in the United States in Dating, Mating, and Marriage."